In 2015, I started an Autism A to Z series and over the years, I have edited and refined the various posts within it. This year, I am touching up almost every post in the series and today, I’m fixing up this one. 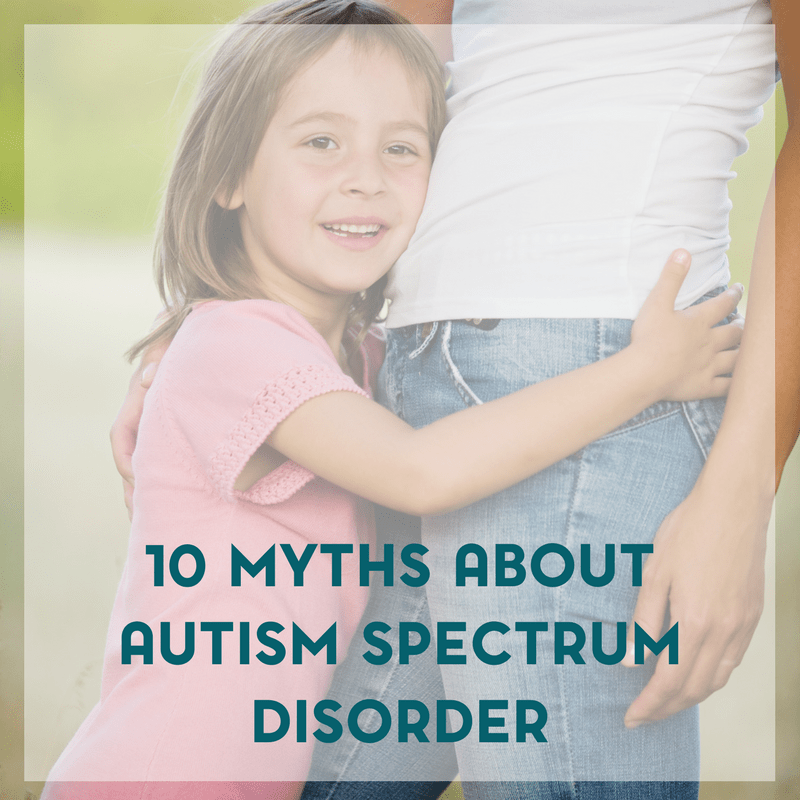 So, let’s get started with 10 common myths about Autism Spectrum Disorder. While it hasn’t happened in quite some time, there were definitely days where we would get a barrage of stares and dirty looks when we would go anywhere with Sweet B. There were times that I didn’t want to go out in public because of this but then I realized- this was my chance and my opportunity to educate and hopefully bring awareness and acceptance for my daughter. False. Autism is a spectrum disorder so this disability runs the gamut. From higher functioning to lower functioning, verbal to non-verbal. Some individuals may have several accompanying disabilities (epilepsy or ADHD for example) in addition to autism. False. Sweet B is very affectionate with people that she knows. And she’s always been that way. 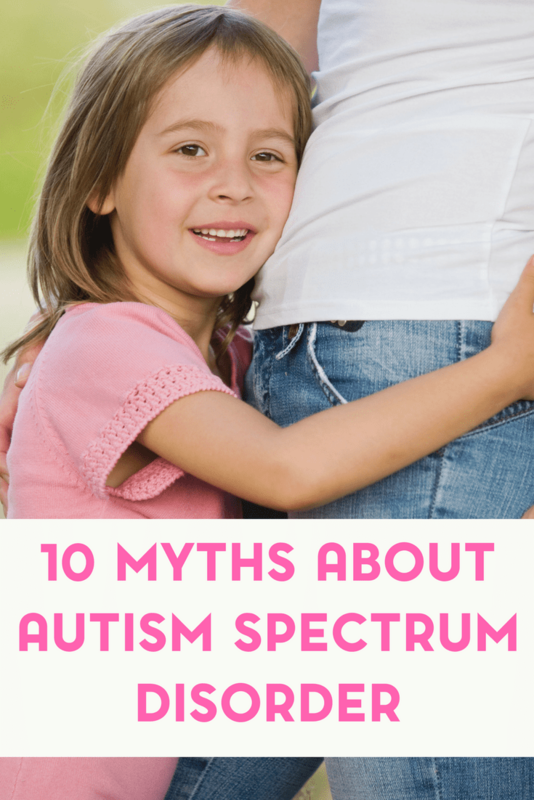 Myth #3: You can outgrow or cure autism. False. You can lessen the behaviors but autism will NOT magically go away overnight. With supportive therapies, you can lessen behaviors and you can make it easier for an individual with autism but this is a lifelong thing. This does not go away when a child turns 18. False. And if someone ever says this to me? Please be there with bail money because I will go ballistic. There are several theories as to what causes autism but nothing has been 100% proven yet. False. When an individual with autism is having a meltdown, it’s because something is not going right in their world and they have lost control. Over time, coping strategies can be developed to lessen the occurrence of meltdowns. 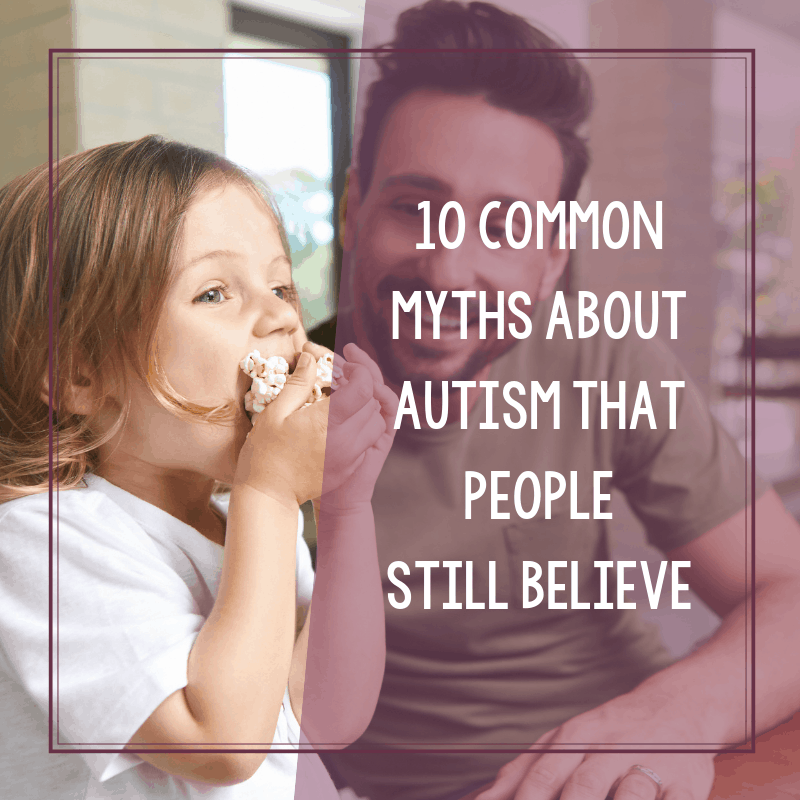 Myth #6: Individuals with autism will never amount to anything. False… and says who? There are many successful individuals with autism. In fact, throughout history, several individuals were suspected to be on the Autism spectrum. Great composers like Mozart, scientists like Einstein. Actor Dan Aykyrod is on the spectrum. Well, that’s a matter of opinion and how you choose to define “normal”. If an individual with autism does look behaved and “normal”? Bless the parents and whatever they’ve gone through to get there. Besides, would you know what to look for when it comes to whether or not someone has autism? Autism does not have a specific look. Again, this is a matter of opinion and how you define normal. For me? Autism is normal. I don’t force Sweet B to adapt to my world, I adapt to hers. But that’s not to say that individuals on the spectrum can’t live independently. For that matter, there are some adults who aren’t on the spectrum who aren’t capable of living normally or independently. No.. some are and some aren’t. To that end, just because an individual is a savant doesn’t mean that they’re also on the spectrum. False. So very false. They have feelings because they’re people. Some individuals just might not be able to express those feelings or they might express them in a different way. Sweet B, for example, when she’s happy- yes she’ll laugh, she’ll also flap her hands, and rock back and forth. When she gets frustrated, she’ll stomp up stairs. Sometimes she may have difficulty managing her feelings, but she definitely has them. 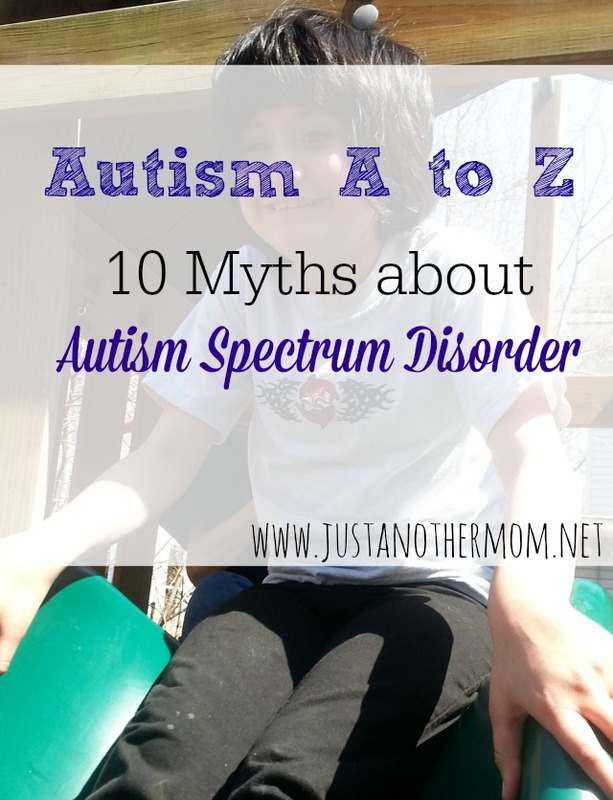 So there you have it- 10 common myths about autism spectrum disorder. Just ten of many, I imagine. And here’s to working towards acceptance, not just awareness for individuals with autism. Myth #3 is myth, at least for some kids. Raun Kaufman, and a host of others. It may not be in the cards for every kid, and I’m not aware og anyone ever ‘outgrowing’ it, but many kids have FULLY recovererd… aka ‘cured’ if you want to use that term. I would not be quick to use the term “cured” when it comes to autism. I believe that the symptoms can be lessened, but it’s always going to be there in some form or another. Thank you so much for this. I have a son on the spectrum and I am fielding these questions about the “facts” all the time. Thank you for spreading awareness. I am currently working on my own Autism post for this month. I have a board on my blog for our experiences so far. I am going to share this post! Thank you so much! Thank you so much for stopping by! 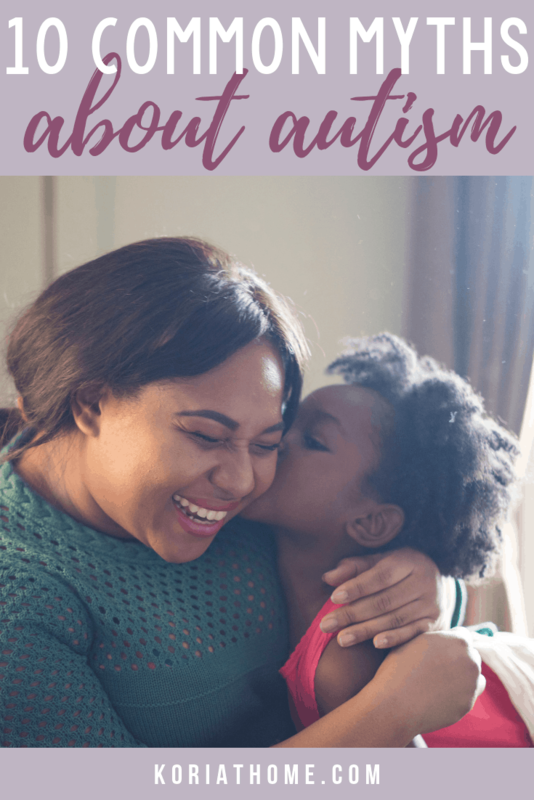 Autism is one of those things that I want to post more about as my 13 year old daughter is on the spectrum. I don’t want to just reserve April for it, but it seemed as a good of a time as any to kick start. I will be sure to visit your blog as well! People often misunderstand autism. Thank u for setting the record straight on some things.